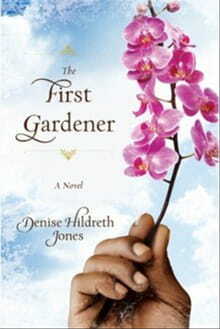 EDITOR’S NOTE: The following is an excerpt from The First Gardener by Denise Hildreth Jones (Tyndale). The heat of the stone bathroom floor warmed Mackenzie London’s entire body as she took her first steps of the day. Beauty surrounded her. Every fixture, fabric, element in this home had been redone to perfection by the previous occupant. The day she moved in, she had determined that she would appreciate every moment she spent in this exquisite place—because she knew those moments were numbered. There might not be much certain in this world. But in Mackenzie’s world this much was certain: she would not live here forever. She had known that when she moved in. And her Italian-Irish heritage pushed her to embrace every facet of life passionately, wildly, and completely. She was determined not to waste one moment of this opportunity she had been given. Today, however, the mansion was the last thing on her mind. “My, my, that’s a good-looking man standing in front of that mirror.” She leaned against her side of the brown marble countertop and gave her husband a sad smile. “Heartbroken.” She scooted up behind him, wrapping her arms around his waist and resting her hands against the top of the towel tied around his hips. She laid her head against his bare back and listened as the buzz of the razor evaporated. Her heart felt heavy inside her chest. She moved her cheek up and down against his back. He laughed and turned so he could face her. His six-foot frame towered over her five-foot-four. He wrapped one arm around her, lifted her chin, and wiped at a tear that had left its wet trail down the side of her cheek. “I know it’s silly.” She dabbed a tissue at her nose. She had one in virtually every pocket she owned. “It’s just kindergarten. But maybe we should have waited until she was six. She raised her head and batted her eyes. The tears fell freely. She knew he was right, but it didn’t change the way she felt. Natural childbirth had been less painful. She moved her hands up to the soft curve in her hips, a smile fighting with the tears. The smile won. She reached for another tissue and swiped at her eyes, then walked back over to her side of the bathroom. The Pregnyl stayed in prominent sight in her top drawer. It had taken her and Gray almost ten years to conceive their Maddie—ten years plus four miscarriages and thousands of dollars. But when Maddie came along, Mackenzie finally had the one thing she felt her life was missing—a child. And now, five years later, she was desperate for another. Wanted it like an ache in the soul wants a healing balm. The latest round of fertility treatments had begun again almost a year ago. They’d bypassed the Clomid altogether this time and gone straight to the injections. To date, the only thing they had to show for it was a sore behind. He had been a good partner in this journey. Though she knew he sometimes wearied of the routine, still he was at every doctor’s appointment, shared each piece of heartbreaking news, and was a pretty good nurse. He’d even become fairly handy with a needle. As she leaned against the cabinet, she suddenly got the giggles. She turned her head toward him, and that was it. She threw her head back and laughed until she was wiping a different set of tears. He crossed his arms, the syringe still between his fingers. But it would take another five minutes before the governor was able to take care of his first order of duty on this beautiful Sunday morning in Tennessee. The twenty-minute drive from the governor’s mansion in Nashville to downtown Franklin, where Mackenzie had grown up, encompassed almost everything she loved about middle Tennessee. America’s perception of the area seemed to be limited to country music, rednecks, and the term NashVegas. But natives like Mackenzie knew there was so much more. A straight shot down Franklin Road took her from her present house to her childhood home. And along the thirteen-mile stretch, she passed twenty-one churches, acres of gently rolling farmland with grazing cattle and horses, golf courses, schools, antebellum homes, and dozens of “meat and three” restaurants offering sweet tea and chocolate pie that were so good you’d want to slap your mama. Of course, Mackenzie could never slap her mother. Her mother would declare that none of it was even capable of being as good as hers. Mackenzie couldn’t argue because her mother was one of the best Southern cooks she knew. And Sunday afternoon dinners with Eugenia Quinn were as much a ritual as Friday night football in the fall. The screen door of the recently remodeled Victorian home slammed against the white wood casing, the noise potentially heard two blocks over on Main Street. “Are y’all still taking my granddaughter to that church where the preacher says ‘crap’ in the pulpit?” Mackenzie’s mother asked. The same words had greeted them every Sunday afternoon since they had taken Eugenia to their church. It just so happened their preacher used a word she disapproved of that Sunday. She had never let them forget it. Eugenia was carrying a big bouquet of zinnias and daisies from her garden, but she still managed to reach down and scoop her granddaughter up in her arms. Eugenia turned her pink, powdered cheek away from him in mock disgust and returned her affection to Maddie, kissing her multiple times on the face. Maddie giggled beneath the kisses. When Eugenia leaned back, a smile spread wide across her pink-painted lips. Mackenzie chuckled and shook her head at the exuberant display. Eugenia had been almost as desperate for Maddie as she had been. Since Mackenzie was an only child, Eugenia’s hope for grandchildren rested solely on her. A load she rarely forgot. She put Maddie down, handed her the bouquet to hold, and led the way through the house to the kitchen, her silver pumps clicking on the refurbished pine floor. When the door of the oven opened, the fragrance of heaven flooded out. The faithful metal pan that held their Sunday afternoon feast was placed on the counter, the aluminum foil piled up in a mound. Mackenzie knew what was underneath that silver dome. Paradise. The aroma had already leaked into every pore of her skin. The back door opened. Mackenzie looked up to see her mom tug at the bottom of her baby-blue linen suit jacket. She still hadn’t changed from church herself. Eugenia had attended Southeast Baptist Church since before Mackenzie was born, and at Southeast Baptist they dressed up for Sunday service—another thing she often pointed out to Mackenzie. Mackenzie stifled her smile. She hadn’t seen her mom this nervous in a long time. Eugenia had always been a symbol of strength to Mackenzie, who had seen her cry only once—when Mackenzie’s father died ten years earlier. Once the funeral was over, Mackenzie had never witnessed another tear, and she’d only heard Eugenia weeping a few times behind a closed bedroom door. Eugenia was tough, a rock. Mackenzie envied that about her. If anything happened to Gray, she couldn’t imagine surviving. “Hey, Burtie!” Maddie squealed and took a leap into Burt’s arms. He let out a half chuckle, half groan. “I love it,” Burt responded, leaning down and planting a kiss on Maddie’s cheek. “I don’t get to see my grandbabies much now that they have all moved away, so it’s mighty nice having a little one in my arms.” The edges of Burt’s plaid suit jacket crinkled beneath her weight. “Maddie,” Gray said, “let’s go sit outside with Mr. Burt while Gigi and your mom get dinner ready. You can tell him what you learned in Sunday school about midgets.” His laughter erupted as he turned toward Eugenia. Maddie jumped from Burt’s arms, and the three of them walked out onto the front porch. “I think the midget’s name was Zach something. . . .” Maddie’s words faded as the screen door slammed behind her. Of all the adjectives Mackenzie would use to describe her mother, she was certain boring had never been one. She was a quintessential lady, a master gardener, a lover of beauty, but she would just as soon cuss you as look at you—though she would never do it in church. She kept her husband’s 12-gauge under her bed and would shoot you first and ask who you were later. She was opinionated and her tongue could be downright withering, but she was also loyal—fiercely loyal. And if the world ever fell apart, Mackenzie was certain that Eugenia Madeline Pruitt Quinn alone could put it all back together. As usual, Maddie was the first one to burst through the door of the governor’s mansion when they finally made it home late that afternoon. Mackenzie heard her pounding up the stairs to the family quarters as she and Gray walked through the front door. Following Maddie up the stairs, she was greeted first by her daughter’s skirt, draped carelessly from one tread to the next. Her eyes moved up the stairwell at the trail of clothing Maddie had deposited on her way to her room. Gray had been the first to use the word poop for what Maddie often did with her stuff. Mackenzie had thought the term was gross, but Maddie was five—she loved it. So it had stuck. And in less than two minutes flat, Maddie had “pooped” her skirt, then her sweater, her shoes, and her socks, leaving a trail of clothing up the stairs. Mackenzie sighed. When Maddie was three, this habit had been cute. Now, not so much. And though they had been working with her on this for the past year, in moments like these, Mackenzie wasn’t sure what all the effort had been for. “Maddie.” Her voice traveled down the hall as she picked up the skirt. Maddie snatched up her skirt and the rest of her clothes and raced back up the stairs. “Maddie went poop,” she announced as she made her way down the hall, filling it with laughter. Mackenzie had to smile. She was way too lenient with Maddie, she knew. Gray reminded her of that often enough, and so did her mother. But she couldn’t help it. Maddie was her miracle baby. And there hadn’t been children in the governor’s mansion since the Lamar Alexander years. Mackenzie was grateful she and Gray had been able to bring this kind of life back into this magnificent house. Restored by the former first lady in a massive renovation project, the mansion displayed all the beauty that a governor’s residence should. But there was something about children in a home. They brought fingerprints to the artwork and syrup-covered hands to the marble side tables. They brought cartwheels to the foyer and a slight irreverence to what could be an often-stuffy environment. Formal dinners could be interrupted with bedtime stories, and hallways lined with pictures of former governors could turn into dance studios for little ballerinas. Best of all, Maddie and her friends brought a contagious laughter that the entire staff loved. “I know. I was watching ya from my driveway. Headed up to see Maddie—okay, Mrs. London?” The boy’s disheveled curls bounced on his head as he took the steps two by two. Mackenzie laughed. “Have at it, buddy.” The fact that he had just entered the governor’s mansion without so much as knocking was lost on Oliver. But Mackenzie didn’t care. She liked having him around. Oliver and Maddie had become bosom buddies last summer when his family moved into Minnie Pearl’s old house next door. His mother, Lacy, had tried to keep him away, but Mackenzie had assured her that Maddie loved him. And he had pretty much become as permanent a fixture around here as Eugenia. The security and house staff knew to let him come and go. Maddie adored him and he her. And Gray declared that marriage was in their future. Oliver’s family had lived in France for two years, and he did know a little French, but for the most part he simply spoke words with a French accent. But to Maddie, who was American and Southern through and through, he might as well be a French interpreter. The two smiled. Maddie threw her hand up, yelled “Bye, Mommy,” and the pounding footsteps resumed, this time headed to the backyard. Mackenzie walked to the palladium windows in the family quarters living room. The two flashes darted across thick grass and headed straight for the trampoline. Their energy could bust through brick and mortar. Mackenzie smiled as she sank into the deep, plush sofa and picked up her pink- and white-striped folder from the glass top of an iron side table. Her assistant, Jessica, always prepared her weekly schedule on Sunday afternoons and left it here for her. She thumbed through her responsibilities for the coming week. Tomorrow she was slated to speak to state educators at a luncheon meeting about volunteerism in elementary schools. It was a subject dear to Mackenzie’s heart, a cherished part of her heritage as a native of the Volunteer State. The term went back to the War of 1812, when General Andrew Jackson mustered thousands of citizen volunteers to fight the British in the South. It had been reinforced during the Mexican-American War, when <span class=Emphasis>then Tennessee governor Aaron Brown requested 2,800 men and 30,000 showed up.</span> And it still applied in Tennessee today, at least as far as Mackenzie was concerned. Convinced that the initiative of volunteerism needed to begin early, she had helped devise an elementary school curriculum to help even the youngest see not only the importance of volunteerism but the endless opportunities as well. She was a firm believer that if you reminded people of what they were created for, they would rise up to meet the challenge—and the earlier it happened, the better. That one experience didn’t change Mackenzie’s opinion of okra, but it did change her life in significant ways. Helping at the soup kitchen so touched her heart that she began to refuse food just so she could go again. Eugenia caught on after the third showdown, and they started volunteering regularly at the Nashville Rescue Mission. Mackenzie had gone on to major in social work at the University of Tennessee and later worked as an advocate for children in crisis. Now she had the opportunity to help children themselves recognize the needs around them. That was one of the benefits of her role as first lady. She could be a mouthpiece for the issues most important to her. Mackenzie scribbled down a reminder to review her notes before bedtime and checked to see what else her calendar held. It was going to be a full week, especially with Maddie’s first day of kindergarten and the big soiree on Wednesday night honoring the volunteers and heroes of a string of natural disasters that had hit the area the past few years. It had all begun with the horrific flood a few years back—an unprecedented disaster for Tennessee. For the first two days in May, some areas of Tennessee had received a record-breaking nineteen inches of rain. There had been twenty-one deaths and more than 1.5 billion dollars in damages. The devastation included some of Nashville’s most precious landmarks—the Grand Ole Opry, the Ryman Auditorium, and the Opryland Hotel and Convention Center. And because few outside the state even knew about the floods—they coincided with an oil spill in the Gulf of Mexico and an attempted car bombing in New York City—Nashvillians had mostly been left to fend for themselves. But Tennesseans had done what Tennesseans do. They hadn’t complained. They hadn’t blamed. They’d just dug in their heels and served . . . each other. Mackenzie had been right in the middle of those efforts—and similar efforts in the wake of a massive tornado in northwest Tennessee and an ice storm that crippled two-thirds of the state for a full week. Each time, she had recognized the spirit that made her state special. That was the reason for Wednesday’s dinner. Mackenzie was determined to honor those local heroes she had come in contact with day after day, those heroes the national media or People magazine would never interview. She had been involved in every detail of the celebration, and she couldn’t wait for it to get here. She looked up. Gray was in his running shorts and red Nike T-shirt. Sweat clung to his face and glistened as the light hit it. He paced around the room, trying to cool off. “Felt great.” He leaned down and kissed her lightly on the lips. Sunday nights at the governor’s mansion were pizza nights. Maddie’s favorite. The child could smell a pepperoni six streets over. She spotted pizza deliverymen quicker than Mackenzie spotted a nice pair of shoes. She nodded, certain the disappointment showed. “Yep.” She had hoped for an entire day to themselves without an interruption. The buzzer sounded at the entrance to the mansion’s family quarters. Mackenzie watched as Gray walked down the long, carpeted hallway. This was a piece of the sacrifice—the only piece that really got to her. The capitol hill bickering she tried to ignore. The picketing of events outside the mansion she saw as people’s rights to their opinions. The media’s interest in Gray’s breakfast choices she simply found silly. But the constant interruptions to their life and the heavy demands on their time challenged her on her best days. Gray opened the door to Kurt Green, his frazzled-looking chief of staff. Kurt’s white polo shirt hung loosely over his khaki shorts as he hurried through the door. He had been in a rush since Mackenzie had met him. And except for his bald head, he looked virtually the same as when he and Gray were Kappa Alphas at the University of Tennessee. Gray reached out and took the file from his friend’s hand. “I know. The lawsuit from that victim's advocacy group over the prisoner release.” He raised an eyebrow at Kurt. “That was before the press got wind of it and decided it would make a great Monday morning headline.” Kurt ran his hands across his hairless skull—a bad habit Gray jokingly claimed had led to his present state. “Stuff like this is what completely destroys reelections.” Kurt had been thinking about the reelection since the day Gray took the oath of office. Maybe even before. Gray’s sigh was heavy in the room. Mackenzie felt her shoulders sag. She knew he was going to work now. “I’ll give you two hours,” he told Kurt. She watched his brow furrow, and he opened his mouth to speak. She watched him as he too headed downstairs toward the office he kept there. And sighed. Over the last three years, it seemed, she had seen more of him going than coming. Copyright © 2011 by Denise Hildreth Jones. All rights reserved. Visit Tyndale’s exciting Web site at www.tyndale.com.